I had the amazing opportunity to attend at the sixth annual espnW Women + Sports summit sponsored by Toyota. The three-day conference brings together top sports industry leaders and pro female athletes to discuss advancing the agenda of women in sports—a message the film embraced more than two decades ago. 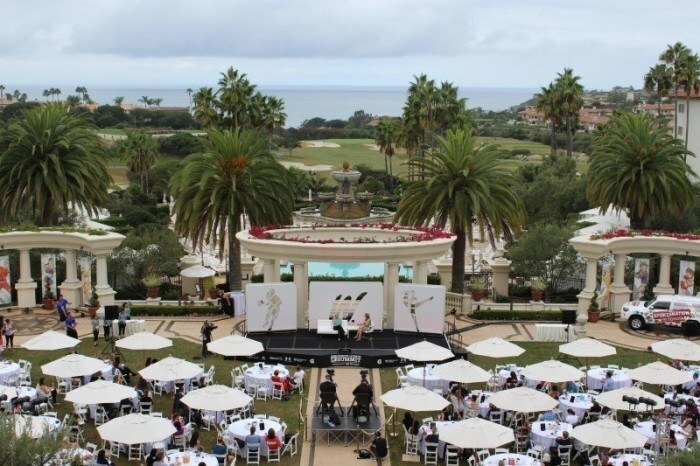 It is held at the gorgeous St. Regis Resort in Dana Point California. The espnW summit is a gathering of professional athletes, sport industry analysts and inspirational men and women both speaking and attending the summit. It was so comforting to hear that even these powerful, accomplished women experience the same ‘early morning workout blues’, and faced the same challenges balancing life as a working mother. Alison Overholt espnW Editor-in-Chief (and mom!) says she gets inspiration from fellow coworkers to get her early morning runs in. She spoke about logging in to Instagram and seeing a fellow coworker who had posted about her workout. Alison says “ I am the worst runner, but a 12 minute mile is still a mile.” These words rang with so much truth for me. As the weekend went on I continued to be filled with inspiration. Amy Van Dyken Six-time Olympic gold medalist Amy Van Dyken spoke about her 2014 ATV accident that severed her spinal cord and left her paralyzed from the waist down. Her speech silenced the room as she described numerous times she overcame adversity. “You tell me that my spine was severed and I would tell you that it is not.” I was not supposed to make the Olympic team, but I did. I was supposed to win a bronze medal, but I walked away with six gold medals. Her speech was themed by her declaration “ Who are you to tell me what I can and can’t do!” throughout. Declared dead, and lived. Told she would never walk, but just took her first 50 steps. But before all of this, was told she would never succeed at swimming and went on to win 6 Olympic medals. Inspiration meter continues to rise…. Want to see her inspirational speech? Watch it here. Under Armour was founded by Kevin Plank in 1996. The company was started mainly as a football company, starting with their signature compression under shirt. Later as the company grew they found women were purchasing the smaller sizes as well. Under Armour took their first shot with the approach a “Shrink it and pink it”, with their first women’s line as Kevin Plank described a $750,000 failure. “Don’t damage the brand.” The line shown at the summit included army green jackets, cool grey leggings and thick back sports bras without a stich of pink to be found. Under Armour now has an entire division dedicated to the design of their Women’s line. The expansion of Under Armour also includes acquisition of Myfitnesspal (and associated apps), a popular fitness and nutrition tracking app and community. Kevin Plank says Under Armour will continue to be on the forefront of health and fitness apps and technology. Growth, Plank said, includes the hiring of 500 people in the last two-and-a-half years, 350 who of which are engineers or app developers on the connected fitness teams. Plank said hiring women has been essential to growing the brand. Also in attendance were the popular U.S. women’s national team stars Abby Wambach and Ali Krieger. This past summer–The U.S. women’s national team received a historic old-fashioned, ticker-tape parade in New York City. The team recieved tons of press coverage, and late night talk show appearances. Even with all of the hoop-la and success they both agreed that Women’s Soccer has a long way to go. Ali Krieger described a recent interaction that proved exactly that. A fan, during women’s soccer season, approached her on the street in D.C.
Krieger plays for the local NWSL team. The fan wanted to know if she was taking some time off to relax or go on vacation. Krieger was in the PEAK of the season! Abby Wambach stressed the need of more coverage of games. They both agreed that in order for women’s sports to get the respect they deserve–they need more media coverage. Ali Krieger described her use of social media as a great tool to connect with fans and show her authentic self. Abby Wambach 35-year-old team veteran joined the team in 2001. She spoke about the evolution of the team. They both described and stressed how each teammate is a total individual. Using social media is a great way for them to connect with fans and show them who they are and what goes in to being a professional athlete. Although the sport has a long way to go Abby Wambach and Ali Krieger both have several endorsement deals including Nike and Gatorade. With opportunities coming at them left and right, Krieger stressed the need to stray true to herself and only work with brands she relates to and believes in. For more from the espnW summit check out the replays and coverage. The espnW summit is a fountain of inspiration, knowledge and motivation. I left feeling powerful as a woman and excited about what I was capable of. Being surrounded by Olypians, professional athletes, and sport industry pros. (Whom all of which were incredible kind and gracious.) I leave feeling uber inspired.